With a lot of Microsoft applications .NET Framework is commonly required during installation. When trying to ThinApp these applications .NET Framework can be required as part of the virtualised app. This post will detail a step you may fine yourself needing to take if you experience .NET related problems with your ThinApp applications. Basically, when you install .NET Framework not all components are executed and compiled during the time of installation. Some of these components can remain uncompiled until the application calls for them. If this is the case with an application you are trying to virtualise you may run in to issues launching the ThinApped application. To get around this, during the installation period (After prescan, Before postscan) run the following command in a command prompt window. 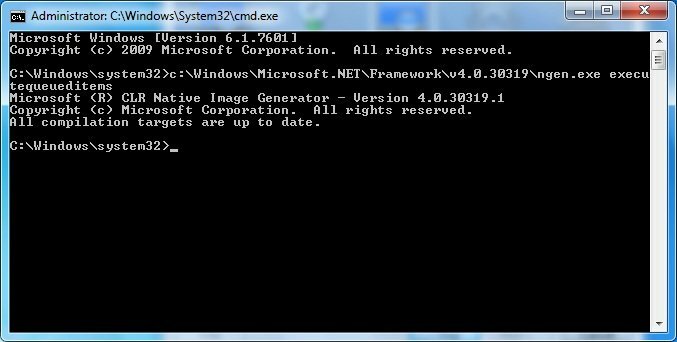 This will compile any remaining components within your .NET installation ready to be captured as part of your new ThinApp. If all components have been compiled, the below message should be returned.